Tradition and Politics: Indigenous Political Structures in Africa was a text layout/formatting and index project commissioned by the volume editor, Prof. Femi Vaughan then at SUNY- Stonybrook and now at Bowdoin College in Maine. The book was published by Africa World Press and is available on the company's website http://www.africaworldpressbooks.com/servlet/StoreFront and all major online retail stores including amazon.com and Barnes and Noble. 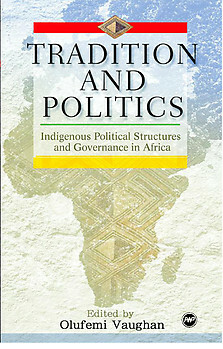 Tradition and Politics: Indigenous Political Structures in Africa is based on selected original papers presented at the International Conference on Indigenous Political Structures and Governance in Africa, held at the University of Ibadan, Nigeria, in 2001 under the auspices of the Ford Foundation. Drawing on the works of leading scholars, this volume explores the interaction between indigenous political structures and modern African states. The book focuses on the response of indigenous political structures to Africa's rapid social transformation in the twentieth century. Analyzed in the context of colonialism, decolonization, modernity, and postcolonial state formation, these essays examine the implications of rapidly changing indigenous political structures for governance and politics in modern Africa. The chapters explore how indigenous political structures foster or hamper local initiatives in governance, and examines their critical role in the dynamic interplay between African states and societies. This is a feast of excellent essays on indigenous practices, a bold achievement at a time when African affairs reveal a state of continual flux. We see creativity when and where it is least expected, compelling us to engage with the ideas that matter, and drawing us back again and again to ponder accepted assumptions. In this stimulating volume, an interesting group of established and younger scholars examines the surprising resilience and revival of chieftaincy institutions throughout Africa. Offering theoretical and comparative perspectives as well as meticulously researched case studies from Southern, Eastern, and West Africa, this book makes an important contribution to debates on the role of traditional institutions in African societies and states. Olufemi Vaughan is Professor of African Studies and History at SUNY, Stony Brook, and also serves as Associate Dean of the Graduate School. He has published extensively on African political and historical studies. He is the author of Nigerian Chiefs:Traditional Power in Modern Politics, 1890s-1990s (2000), winner Cecil B. Currey Book Prize, Association of Third World Studies, and Chiefs, Power, and Social Change: Chiefship and Modern Politics in Botswana, 1880s-1990s (2003).